The prospect of a missile war between North and South Korea poses a threat to regional stability that previously seemed unimaginable. Images of North and South Korean gunners firing ballistic missiles at one another from redoubts far north and south of the demilitarized zone are edging closer to reality while the North reinforces three tiers of short-, mid- and long-range missiles and the South acquires hundreds of its own. It’s as though the protagonists are moving these engines of modern warfare into place while the great powers surrounding them appear unwilling or unable to stop them. South Korean military planners, freed from constraints on missile production previously imposed by their American ally, are counting on a new missile with a range of 800 kilometers ― far enough to hit virtually anywhere in North Korea. They also are building up their inventory of short-range Hyunmoo missiles plus long-range cruise missiles that can go at least 1,000 kilometers but say they need many more in case North Korea unleashes a barrage of its 1,000 missiles all at once. The Americans may have sold the South Koreans on its Terminal High Altitude Area Defense (THAAD) in a “Star Wars” scenario, but South Korean strategists, with the full support of their U.S. ally, are focusing on the Korean Air and Missile Defense (KAMD) plan. They see KAMD as needed here and now while THAAD looks like a high-cost venture that may never be used in combat. With or without THAAD, the question is how long before an exchange of missiles ushers in a new era of warfare in a region ever fearful of another Pacific War for control of Asia. The history of violence on the Korean Peninsula is so full of surprises, we can never be sure what’s going to happen next. 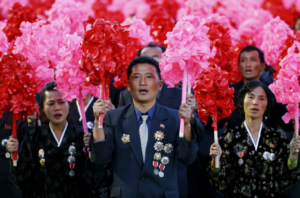 Since the invasion of the South by the North in June 1950, the Korean Peninsula has seen one surprise after another, but we tend to forget them in the miasma of history. How much do we remember of the mini-crisis of a year ago after a North Korean mine blew off the legs of two South Korean sergeants inside the DMZ? We might not have to worry about a looming missile war were it not for constant reminders from the North Korean side. One day the North threatens to blow up the White House with a warhead affixed to a long-range missile, and the next they’re talking about raining death and destruction on the South. Nobody thinks the North Koreans are about to fire one of those things, but think of the chaos if they did. Panic would ensue. The U.S. and South Korea would retaliate with air and missile strikes. The North would fire more missiles, and we’d be off on Korean War II. It all seems so phantasmagorical. Among the greatest constraints on the North’s firing a missile is the memory of the death and destruction suffered in U.S. air strikes against the North in the Korean War. Much as the North Koreans, or at least their leader Kim Jong-Un and the men around him, would like to avenge the disasters inflicted on their country more than 60 years ago, they’re reluctant to invite still more disasters by advancing from ritual rhetoric to reckless war. They’re already paying a tremendous price, depriving their people of food and medicine, just to gain global publicity every time they test fire a missile. Recent visitors to Pyongyang sense new pride and prosperity. The North Korean leadership, they say, is brimming with confidence, secure in the knowledge they have not only the missiles but also the bomb. After four underground nuclear tests, while planning for a fifth, Kim Jong-Un believes North Korea can stand up to attack from the U.S. and South Korea. The flaw in that argument, though, is that North Korea is not about to be attacked. The U.S. and South Korea are not going to initiate a war. Kim Jong-Un is wasting his money at the expense of the vast majority of North Koreans whom visitors to Pyongyang never see. While he’s seen grinning exuberantly whenever North Korea conducts another test, we read the usual reports of hunger over wide stretches of the rest of the country. The cycle of rhetoric and testing never ends. Or will it ― some day? North Korea’s propaganda machine has warned of a “preemptive strike” ― that is, a first strike by the North. That’s no laughing matter ― though most of us prefer to shrug it off as the same old stuff.